Get ready to be taken on the ride of your life in the latest instalment from New Zealand author Rachael Craw. 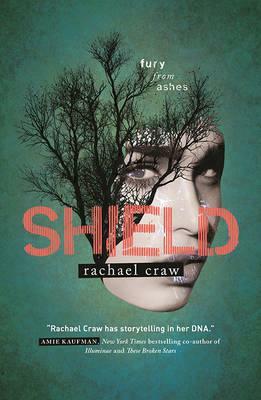 Shield is the final book in the popular Spark trilogy. The first part of this gripping young adult sci-fi series, Spark, was released in 2014 to rave reviews, followed by Stray in 2015. In the latest book, the drama continues but this time Evie is out of options. She must comply with the Affinity Project in order to survive. Evie must obey their rules, play their deadly games and give up Jamie. When Evie decides to help a small group of Shields trying to affect change, she finds herself in all sorts of trouble. Counsellor Knox is determined to reveal her secrets and tie her to the Affinity Project for life. To protect her family, Evie must betray those closest to her. The odds of success, and of Evie’s survival, are slim. Shield is a fast paced, action-packed thriller that will grab reader’s attention from the very first page. It is an original, exciting story with underlying themes of friendship, loyalty, courage and love. Shield is perfect for teenagers with a passion for sc-fi and for anyone who enjoyed The Hunger Games Trilogy by Suzanne Collins and the Maze Runner Trilogy by James Dashner. Rachael Craw is a prolific talent as evidenced by her latest book. She has the ability to produce brilliant work that is well-written and contains just the right amount of action and excitement to enthral readers. A great read and highly recommended.